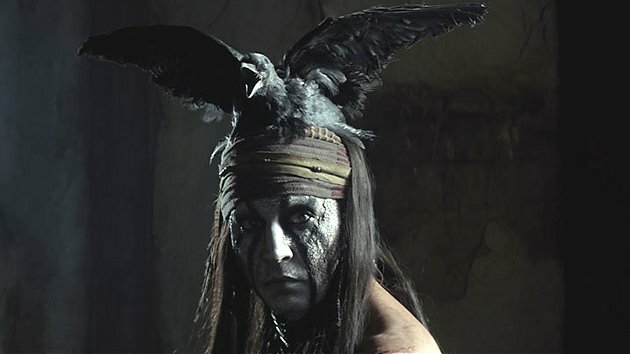 Newspaper Rock: Little criticism of Depp's Tonto?! By Bryan EnkHave you noticed that there has been (rather surprisingly) very little public outrage over Johnny Depp being cast as Tonto in "The Lone Ranger"? That's because Disney, in true Tonto style, heads it off at the pass. Depp plays the Ranger's Native American partner in the upcoming multi-million dollar extravaganza that reunites the superstar with his "Pirates of the Caribbean" director (for the first three installments, anyway), Gore Verbinski. Disney wants "The Lone Ranger" to follow in the footsteps of "Pirates" and become a major franchise for the studio, a mission that included making sure that Depp's casting didn't offend the Native American community. Disney, as always, played it smart and savvy. The studio--and Depp--embarked on a broad outreach program early in pre-production, courting Native American approval long before cameras rolled by having several Native American leaders involved in the script's development. During filming, Depp--who has identified himself as being of Native American ancestry--was adopted into the Comanche Nation via a private ceremony in the presence of then-tribal chairman Johnny Wauqua. Disney even had local Navajo elders perform a Navajo blessing before production commenced in Monument Valley, and LaDonna Harris, a leader of the Americans For Indian Opportunity, was invited on set. The good relations continued after production wrapped, with Depp flying to Lawton, Oklahoma to join "his people" at the Comanche Nation Fair. Disney has also created a character worthy of all of this attention and approval. The Tonto of the 1950s television show spoke broken English and lacked character depth, serving as little more than an amusing sidekick to the heroic Ranger. Depp's Tonto is claimed to be an authentic portrayal of the character's rich Comanche heritage.Enk misses the mark badly wiht his last comment. Based on the trailers, Depp's Tonto also speaks in broken English. More important, neither nor anyone else has claimed the Tonto character represents an authentic Comanche. The prima facie evidence--the ridiculous crow-head costume--argues just the opposite. Adrienne Keene of Native Appropriations reposted this article on Facebook along with this comment:Funny that this gets posted today..."Have you noticed that there has been (rather surprisingly) very little public outrage over Johnny Depp being cast as Tonto in "The Lone Ranger"? That's because Disney, in true Tonto style, heads it off at the pass." Um, clearly Mr. Bryan Enk didn't google "Johnny Depp Tonto"--because google even auto fills "Johnny Depp Tonto controversy" and "Johnny Depp Tonto racist." I'd say there's been quite a bit of public outrage.Her followers chimed in with the following:White media consuming only white media, translates to: Pats on the back, "Oh boy, we're awesome!" He is NOT Native, he was adopted by a Comanche family and his supposed Cherokee blood was proven to be a lie as someone had done his family history and they were all listed as white, the reason people don't want to believe this because they've put him on a pedestal, he's just another white guy who is going portray Natives with every cliche and stereotype out there. I get that he's half Cherokee. That's not why he got the role. He got it because he's Johnny Depp. I for one am boycotting the movie, I love Johnny's work 99% of the time. But I can name a dozen Native actors who should've gotten the role over him and if he really respected Native culture he would've bowed out with grace and humility and given the role to a real Native American instead of buying himself an adoption in order to give himself credentials. How is it that anyone thinks this guy has any Native ancestors still? This is at least partly the same team that did the 'Pirates' movies--it's not really surprising that Depp was cast, and as someone known for being part-Native American (although I don't know now if that's true, based on above comments), Disney probably thought they had a free pass. Which is a shame, because there are plenty of talented Native American actors out there who could have been cast in this role but were passed over in favor of a less accurate (read: more offensive), but more prominent name. Publicity, folks! I think most people who believe he's part Native also consider themselves part due to the eponymous Cherokee princess grandmother. Depp is no more NDN than any frat guy in a headdress is on Halloween. Fans of his who claim otherwise need to pull their heads outta their asses. doesn't explain the title question. The answer is simple and obvious: to forestall criticism of Depp's performance. To give him instant credibility among gullible audience members. In other words, the way to whitewash redface is to get Natives to shill for you. For more on Johnny Depp, see Michelle Shining Elk on Johnny Depp and Depp Too "Pretty" to Play Natives? !